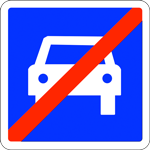 To someone used to driving in North America or Japan, the sign above clearly and unambiguously means “No Bicycles Allowed”, because anything with a diagonal red slash through it means “No whatever Allowed”. 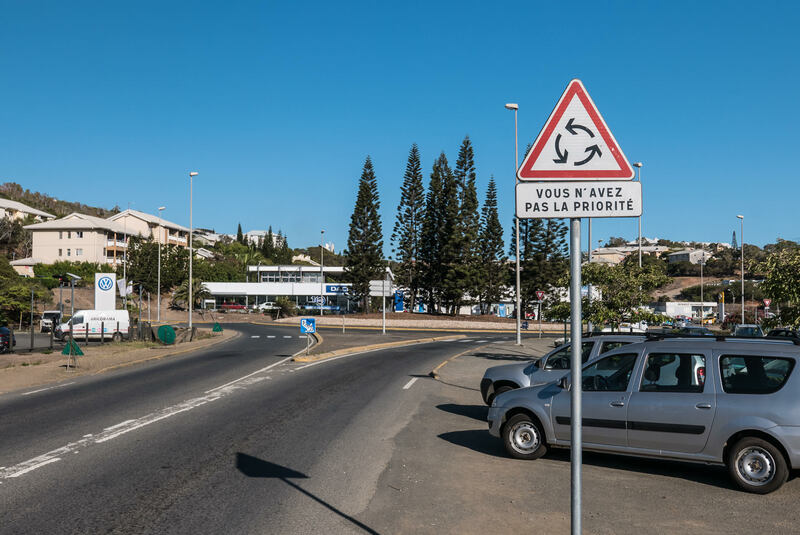 Along those lines, the sign at right would clearly mean “no cars allowed”, but in New Caledonia I'd see this sign at each expressway off ramp, a spot where a “no cars allowed” sign would be jarring to say the least. The first time I noticed it, it was at an exit that I was thinking to take, but upon seeing the sign I quickly changed my mind... “No Cars Allowed”! 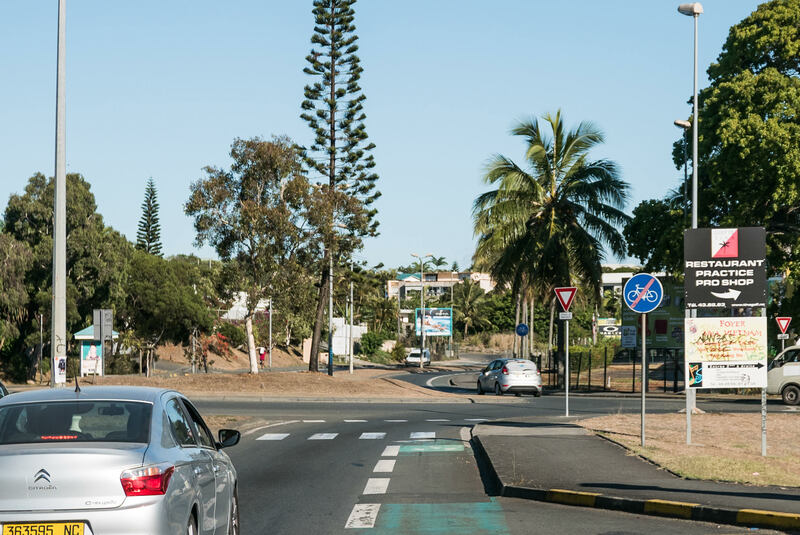 Once the initial shock wore off, I realized that it must mean “End of Cars-Only Road”, and so in New Caledonia (and likely Europe as well), a red slash means “End of whatever Restriction”. 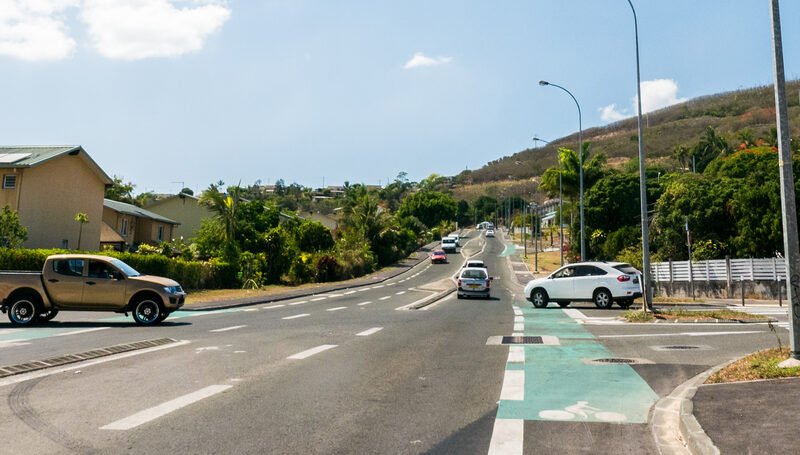 So, a superficial answer to my quiz question is “End of Bicycle Lane”. Still, that leaves the question of why the sign appears in a spot where the lane clearly doesn't end. The path that continues from that point was quite new, so I just assumed that they'd not yet removed the sign from when it really was the end, perhaps due to a classic government-worker “not my job” issue. 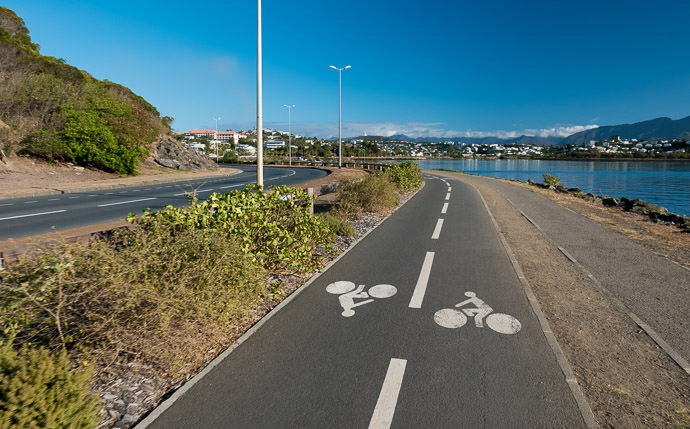 However, as answers came in to the quiz, I had to re-evaluate my idea of what “Bicycle Lane” meant. I had assumed that it was a restriction on what can travel in the lane (bicycles only), so the sign was a restriction against cars, pedestrians, etc. But then I realized that it could be the other way... it could be a restriction against bicycles, that they must travel in this lane and may not travel on the road. 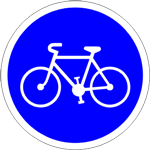 So further research brought me to this page on the site for French cycling-related organization, and it seems that a circular blue-background white-bicycle sign means “bicycles (and only bicycles) must use this path”, while a square version means “bicycles (and only bicycles) may use this path”. In retrospect, this makes some sense. While driving in the middle of nowhere on a road with a bicycle path, every time we came to a short narrow bridge, there'd be an “end of bicycle path” sign at the start of the bridge, and a “bicycle path” sign a car length later at the end of the bridge. It seemed to me to be an excessively verbose level of detail for a road that might get a few cars an hour, but if it's releasing the cyclist from an obligation so that they can cross the bridge, well, I guess it makes sense. Somewhat. Being a country with French as the national language, I somehow thought that the stop sign would, you know, be in French, such as “Arrêt”. It's been more than 25 years since I last drove in Quebec, but I seem to recall their stop signs being “Arrêt”. Then I found this page that talks about how “Stop” is actually a proper French word (stop signs in France use “Stop”), and that because some areas of French-speaking Canada are so anti-English that they don't want even the possible misunderstanding that their “Stop” might be the English “Stop” instead of the French “Stop”, so they use improper French (“Arrêt”, which in proper French is apparently is more of a “bus stop” kind of “stop”). No matter what's written on it, the red octagon speaks for itself across much of the world, so even if it said, for example, 「止まれ」instead of 「STOP」, most folks would understand. Then I started to think about Japanese signs, and I realized how opaque the must be to newcomers. The signs above makes complete sense, but I'd often see the “!” sign alone, without any indication of what was being alerted. It felt a bit silly. I eventually realized that it could only mean “Ken Thompson Nearby”. 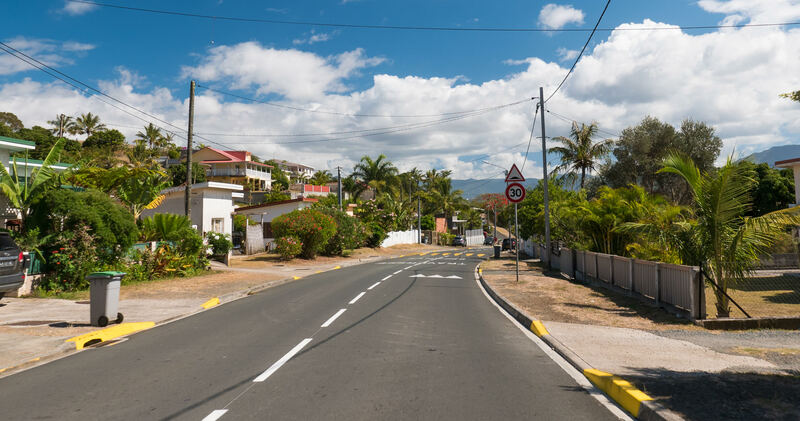 As I rode through this neighborhood, I realized that except for the street signs and the color of the road paint, this picture looks like it could have been taken in Southern California. As I write this blog post, I realize that I was speeding. Oops. Both turn-restriction signs made intuitive sense to me, but again in thinking about Japan, I realized how different it is. When it comes to turn restrictions, Japan doesn't have signs that indicate what you can't do (there are no official “NO LEFT TURN” signs in Japan, for example), but only what you can do. So of the pair above, the “Right Turn Only” would be the same in Japan, but the “No Left Turn” sign would instead be presented as a “Straight and Right Only”, as illustrated at right. I've been driving in Japan on and off for more than 25 years, and this still gets me. I learned to drive in America, so it's ingrained at the neuron level to look for “No Left Turn” signs if I'm thinking to turn left, and not at all ingrained to look for some other turn-restriction sign to see whether it happens to include the “left” that I want to do. It's still very unintuitive to me. Actually, one more street-sign thing: in Japan there's one particular street sign that I think is by far the most common, perhaps by an order of magnitude beyond the next-most-common sign. What is it? ‘No left turn’ (forbidden sign) indicates that there is a road to the left with a lane heading in the direction you’re looking for, but you just can go there from where you are now. 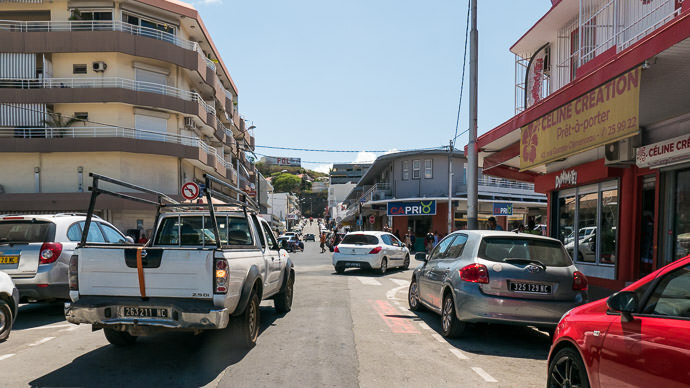 The sign is mostly used when there just isn’t enough room in the middle of the crossroads to take up the waiting traffic. Perhaps in Japan this just is never the case? 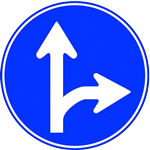 ‘ turn right (or ahead)’ (blue sign) indicates that there is no road/passage even if it looks it. Could be a one-way road or blocked off. Donald Knuth is a big sign guy. I saw a lot of pedestrian only signs in Japan. The figures were very disproportionate with bulges and bends. I though they meant aliens from space. Reminded me of the figure on my Matisse ‘The Fall of Icarus’ t-shirt. This post shows an interesting view from someone who betrays an American upbringing regarding driving. There is a fundamental difference between American and European traffic signs. American signs are much more verbose and mostly text, whereas European signs are mostly codified as symbols. An obvious example is the “No left turn” sign, or even “Speed limit”. 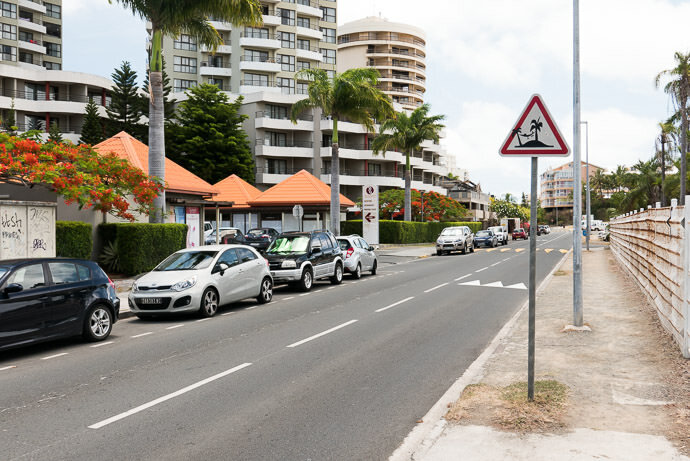 Perhaps the European signs are mostly symbols to homogenise a large patch of land with a multitude of languages (see Vienna Convention on Road Signs and Signals). I personally prefer the European approach, but I’m biased 😉 This also translates to the signs inside the car (e.g. in American models of cars the handbrake dash indicator often is a red “brake”, while European versions have something like (!)). 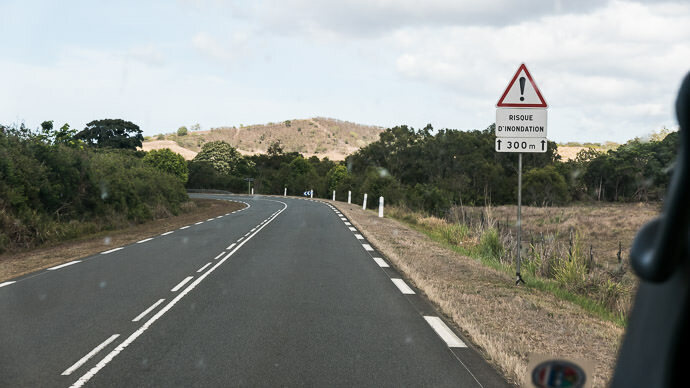 Triangular signs with tip up and red border mean danger. The “!” sign means something like “various dangers”, and can be used in a variety of things. The roundabout one warns of a coming roundabout. It says you don’t have the priority — it is whoever is first in the roundabout that has the priority. It is equivalent of using the upside down triangle “yield”, and is often used with the circular blue roundabout sign. In France this variety is very common; in other countries the blue circular is more common. Often they’re used together. 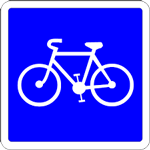 Going back to the bike sign. Although circular blue, I believe in most countries this is not strictly a mandatory sign (as well as the associated pedestrian way sign — there are also mixed pedestrian/bike way signs). Bikes can still use the road. It is really more of an informative sign saying that there is a bike path, but bikes can still ride on the road. 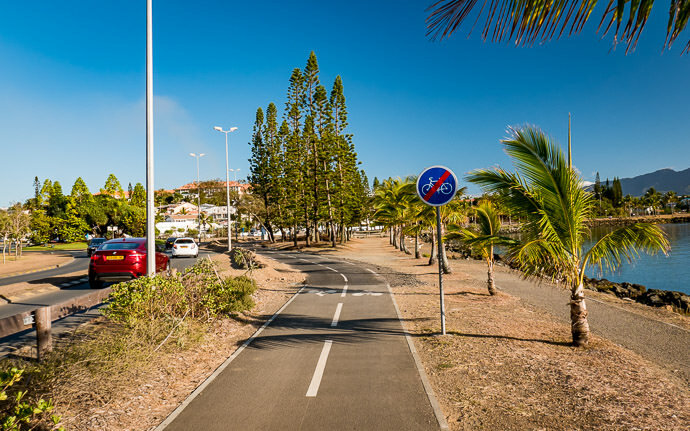 When bikes are not allowed on the road it is more common to use the bike forbidden path (white background red border). 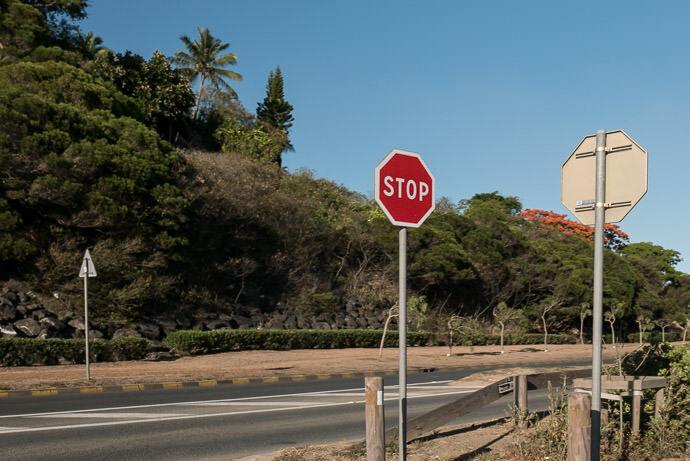 Building on Tiago’s comment: The US and EU define the two major signage systems in the world and, aside from the stop sign, they are almost completely different from each other. 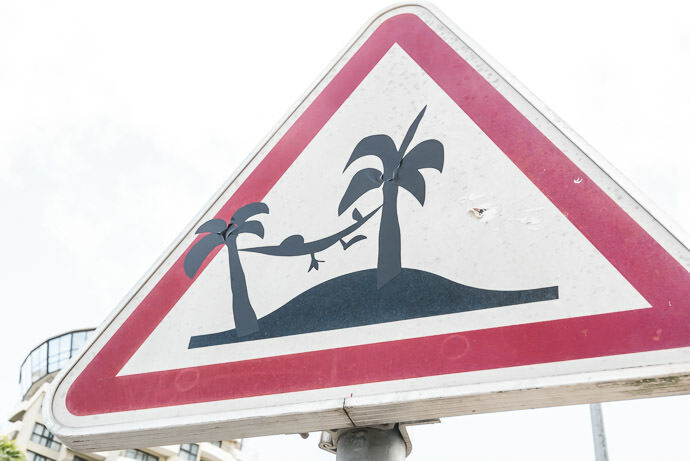 What’s interesting is that some South Pacific nations (New Zealand that I’ve experienced, and from pictures I’ve seen, Japan is similar) use a hybrid of the two systems, using Anerican-style warning signs and European-style regulatory signs. From your description, it sounds like New Caledonia uses the full European style (aka Vienna Convention). Here in Scotland we had a sign some years ago in an area called Torridon. Very rocky, mountainous and bleak in the right weather conditions. Someone had modified a ‘sheep’ sign into a mammoth. Very appropriate, and caused quite a few double takes! It was a single lane road with passing places, a phenomenon now becoming quite rare, even here. To understand the “Priorité” sign, you have to understand that in France the rule of “priorité à droite” applies, sometime excessively. That is that at an intersection the car arriving from the right has priority.